Our Genes make us and decide a number of physical traits of our body. But genes do much more than just deciding our height and color of eye. Some genes makes us resist from some diseases while some make us prone to them. All of our body cells contain same set of genes, but still brain cell looks different from muscle cells. It is due to the fact that some genes are turned ON in one type of cell while different set of genes are turned ON in other. When a gene is turned ON, it produces certain proteins which are used by body for some specific task. This process of generation of proteins is called Gene Expression. Recently some researchers focused their research on a capability of our body to turn genes ON and OFF depending on the need of body. The process of turning genes ON and OFF is called Gene Regulation. Some diseases can be controlled if we can turn genes ON and OFF through some medicines. It is a topic of in-depth research to find how only genes in cells of a specific organ can be turned ON and OFF treat a disease. It is utilizing capability of our own body to treat a disease. Our DNA is a group of 23 pairs of chromosomes, which are home of the genes. According to an initial estimate our genes can create more than one million different proteins. RNA copies the protein code from DNA and employs the cell to create a protein. Some non-coding RNA, which are not used in protein synthesis are employed to tell these proteins where to go and what to do. This process not only creates our body but also helps in maintaining it. This process in in the root of all complex process of our body. We can't even "think", if this process don't happen in our body. We the humans have got around 20,000 genes in our body. 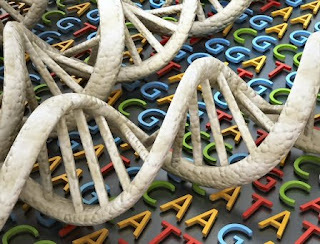 One-third of these genes are always active in our brain, which makes us what we are. They make us how we move, think, feel and react. Proteins developed by genes in brain cells make them able to communicate with each other. Genes active in our brain are responsible for our whole personality. Even two identical twins will have different personality, in spite of the fact that they have got identical DNA and Genes. It is because our gene expression differs. This difference in gene expression is due to our different experiences of life. No two people can have similar experiences, even if they grow up in similar atmosphere. The air we breathe, the TV show you watch, the people you speak to, the game you play, the subject you study, the diet you eat, the diseases you suffered from, the physical activities you do, changes your gene expression. No matter how similar we look, our brain is different from inside, as our gene expression in different. Our experience in real life can turn some genes OFF and turn some other genes ON. That's why some childhood experiences can impact the behavior of a person for lifetime. Even the experiences that we face in mother's womb can affect our genes, as most of our brain develops during those nine months. Can our brain turn genes ON and OFF as per need ? You may say that our brain turns genes ON and OFF as per need, but the truth is that our brain is itself made by these genes. Genes can regulate how our brain work. However normal metabolic activities are controlled by our brain, and some visible changes in our body are always controlled by brain. Our brain might be responsible for Gene Regulation in other parts of body. Some experts believe that diseases like Diabetes and Blood Pressure can occur due to both genetic and environmental risk. If you have understood genes in depth then you would agree with the fact that our environment can change gene expression and regulate it. Here the term environment means both our diet and lifestyle. If a born genius does not get an environment to nurture his/her talent, then the genes responsible for making him/her genius will get suppressed and not express their full potential. So a good environment is must for human development. Conclusion : What i have understood as per my grasping power about genes is that our environment controls it, not just our brain. So a better environment can lead to better health as the bad environment changes our gene expression and make us suffer from different diseases.